Le﻿﻿onida﻿﻿s Kassapides (kassapides.com) is a Karaghiozopektis and he has been touring Greek Traditional Shadow Theatre for the past 20 years. He has performed in Larry Reed's Shadowlight productions of In Xanadu, The Wild Party, Coyote's Journey, 7 Visions, Kawit Legong, Dangerous Flowers, and assists Larry in wayang performances. He directed the shadow sequences for Lou Harrison's opera Rapunzel, conducted by Marin Alsop. In 2000 he created the first large scale production of Greek shadow theatre. The Metamorhisis of Karaghiosis played at The Randall Museum, Dolores Park and SomArts. Leonidas has been teaching shadow theatre technique design and performance for the past 15 years. 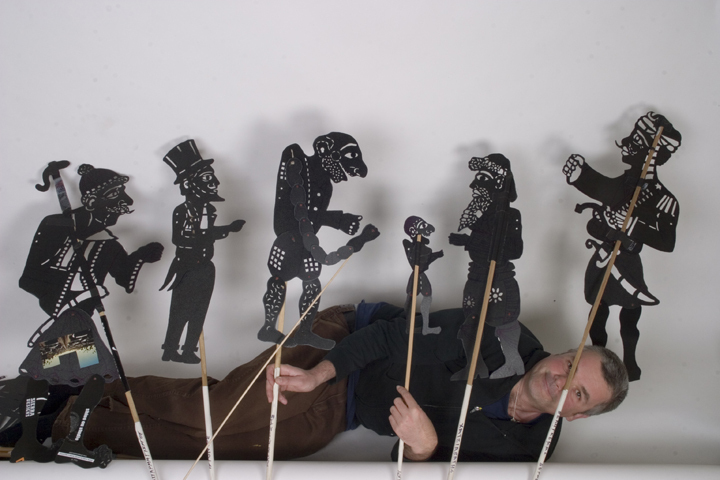 Leonidas teaches shadow puppet theatre for students K-12 in Bay Area schools. He has taught an extensive residency at Buena Vista Elementary, where he worked with the entire student body to create original performances with every class. For younger students, Leon uses tools and materials that are already available in the classroom (overhead projector, construction paper, tape, string, butcher paper etc.) For older students, he uses halogen lights, which he provides. Shadow theatre can be applied in any subject that a teacher may want to give creative emphasis, from geography and history to math and science. 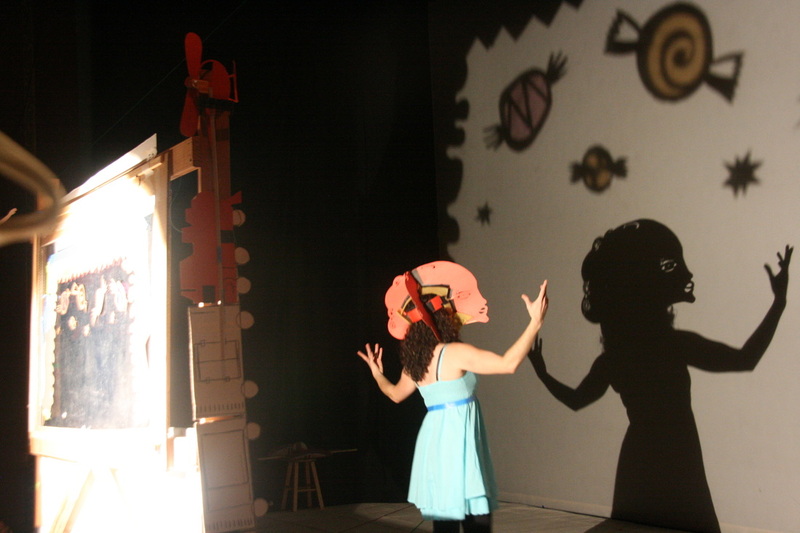 Shadow theatre is ideal for shy and reserved students, because they perform behind a screen and they feel like they are producing live animation with their imagination, facilitated by a low tech approach. Sarita Ocón is a professional actor, visual artist, and media arts educator. Sarita has been performing on the national tour of "PLACAS: The Most Dangerous Tattoo" written by Paul Flores, developed with and directed by Michael John Garcés, supported by the partnerships of community organizations, such as the San Francisco International Arts Festival, the Mission Cultural Center for Latino Arts, the Central American Resource Center and other collaborating Latino theaters of the National Performance Network (NPN). Theatrical credits include performances with Berkeley Repertory Theatre, Bindlestiff Studio, BRAVA Theater Center, CAL SHAKES, Campo Santo, CASA 0101, Gala Hispanic Theater D.C., Golden Thread Productions, Intersection for the Arts, Los Angeles Theatre Center, The Playwrights Foundation, San Francisco Playhouse, San Francisco International Arts Festival, ShadowLight Productions, Shotgun Players, South Coast Rep, Teatro Visión, Ubuntu Theater Project and many others. Sarita is currently a teaching artist for the East Bay Center for the Performing Arts' Learning Without Borders program, providing new innovative learning through digital media arts and stop motion animation. She is also a shadow theatre artist with ShadowLight Productions and is part of their education team, bringing shadow theatre to classrooms throughout the Bay Area. Sarita holds a Bachelor of Arts in Comparative Studies in Race & Ethnicity from Stanford University and was a recipient of the Institute for Diversity in the Arts Fellowship. She is a proud member of the Bay Area Latino Theatre Artists Network. Sarita holds a Bachelor of Arts in Comparative Studies in Race & Ethnicity from Stanford University and is a recipient of the Institute for Diversity in the Arts Fellowship. She is a proud company member of the Ubuntu Theater Project and co-founding member of the Bay Area Latino Theatre Artists Network. Sarita performing in "Ghosts of the River"
daily routines has led her to experiment extensively and collaborate with a diverse number of groups. Her artistic career began in 2001 with the founding of a small theater troupe and a performance art group both in Portland OR. Inspired by a vibrant art scene, she was lured to Chicago in 2003. In Chicago, she developed her live performance skills as a member of the band/art collective, Mahjongg, with whom she toured and performed live in the U.S., Canada, and France. She recorded with Mahjongg for the album, Raydoncong 2005 released by Cold Crush/Dim Mak Records in 2004. Since 2006, Caryl performs, builds, sings and plays prepared violin in Oakland/LA based all female art collective, 0th, (zeroth). 0th uses audio, multimedia art, technology, and robotics in their installations. 0th have performed and installed art at The Lab, Theatre of Yugen, SF Electronic Music Festival and Southern Exposure in San Francisco, the Zero1 Biennial in San Jose CA, Berkeley Art Museum, Berkeley and in May 2014 at the Yerba Buena Center for the Arts, San Francisco for the monthly art gathering, ConVerge. Caryl captained and performed on large junk rafts and kinetic sculptures designed by the artist Swoon down the Mississippi River in 2007 and the Hudson River in 2008 with the Miss Rockaway Armada and Swimming Cities of Switchback Sea projects, respectively. At a series of scheduled stops on the Hudson, the raft crew performed using the rafts as a stage in an original play written and directed by Lisa D'Amour. The voyage ended by docking the rafts at Deitch Projects in Long Island City to connect them to a large installation by Swoon in that waterside gallery. She received a BA in Rhetoric with a focus in Narrative and Image from UC Berkeley in 2014.
multiple productions as ensemble member, assistant director, shadow designer and shadow theater consultant. Her show credits include Ghosts of the River, The Good For Nothing Lover, The Magic Flute (Ballet Austin), Jana & Baladoor (dir. Bahram Beyzaie), and Poro Oyna. She has also worked with ShadowLight creating art installations, teaching workshops and classes for adults and children in museums, arts organizations and schools. Puppet and Mime Festival in Greece and Istanbul International Puppet Festival in Turkey. students to explore and develop creative outlets. Shadow theater may be integrated into any subject to help deepen understanding of a subject, story or concept. Students are encouraged to be imaginative and to collaborate. It is important that her students see themselves as part of an ensemble that must work together to show and tell a story. Lorna Velasco is a veteran San Francisco theatre artist whose training began at Bindlestiff Studio with co-founding director, Chrystene Ells. She continued her theatre training at UC Berkeley, where she majored in Anthropology, and at the Arts Institute of Indonesia, where she was trained in classical dance, mask making, puppetry and music. She is a principal puppeteer for Artistic Director Larry Reed’s, Shadowlight Theatre company and has toured California as part of the three-year California Project. Locally, she has performed at the Magic, Zellerbach, Theatre Artaud, Brava, Yerba Buena Center for the Arts, Intersection for the Arts, and has been a resident theatre artist at Bindlestiff Studio for twenty years. She was assistant director for Octavio Solis’ Ghost of the River, Co-Director of The Movement: Roots, Rocks and Resistance and Ramon Abad’s Tico Tico Puppet Show. Directorial credits include, a Pinoy Midsummer, Immigration Blues, Bienvenido Santo’s trilogy, Lakbay, and the short film Manicure. She was Co-Artistic Director of Bindlestiff Studio in 2003-2004 and the Artistic Director of The Third Annual Under 24 Festival. Most recently, she produced the U.S. premiere of Rody Vera’s, The Guerrillas of Powell Street, based on Benjamin Pimentel’s award-winning novel, Mga Gerilya sa Powell Street, based on the Filipino World War II veterans 50 year fight for equity. Lorna has been teaching Shadow Theatre since 1994. Her teaching experience spans across the Bay Area and beyond at locations including the Filipino Community Center, Bindlestiff Studio, San Francisco State University, Filipino Education Center after school programs, the Muhammadiyah Orphanage in Yogyakarta Indonesia, the Youth Ambassador Program at Yerba Buena Center for the Arts, Vietnamese Youth Development Center after school program, Bessie Carmichael Elementary School, and Mission High School after school program.